Errol Morris has always been more successful when focusing on strange, passionate subjects, in particular off-kilter working professionals who preform odd jobs with joyous satisfaction. His Fast, Cheap, and Out of Control stands as one of the best nonfiction films of all time, an exhilarating peace which uses eccentric and fascinating subjects as a springboard toward breaking down the simplistic boundaries of the genre. 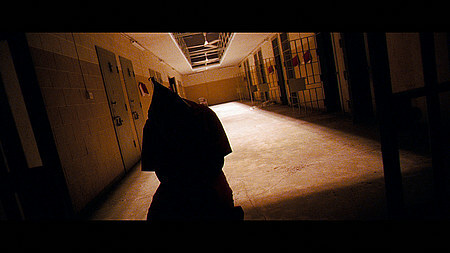 On the flip side, Morris has recently and less successfully taken aim at political figures and situations, beginning with his Robert McNamara confessional The Fog of War released in 2003, and now Standard Operating Procedure, which confronts a mosaic of soldiers, interrogators, and high brass involved directly or indirectly (is there a difference) in the Abu Ghraib scandal. Whereas FOW merely attempts to remind its aging subject of his horrific atrocities, SOP functions as a full blown Horror film. Morris’ obsession with the tension between visual documentation and reality becomes a recurring theme in SOP, and in turn a direct parallel with the human element involved. One indicted Army M.P. surmises that if there weren’t any pictures, the Military would have pushed it “under a rock.” Not new material, and the shock such atrocities actually happened and/or would have been covered up doesn’t produce the biggest gasps. Instead, the almost normal nature with which Morris’ subjects move from explanation, to excuse, to remorse, without batting an eye, becomes the horrific centerpiece of the film. There’s almost no emotional difference between these traditional subject arcs. The banality of the responses evokes a grander lack of accountability in the current Iraq War and the Bush Administration as a whole, a trickle down effect of devastating proportions. Morris attempts to fluff up the material with his standard slow motion reenactments, but these purposefully shocking narrative markers interrupt more than they inform. Overall, Standard Operating Procedure is a blatantly lop-sided affair, painting its guilty subjects not as people, but as cliches of an American ideal gone dumb, while offscreen the rest of the world wonders how the powerful saviors have become so clueless to the violent consequences of their own actions. But maybe it’s a brilliantly constructed one-sided attack, one that needs to take its polarizing material, grab the viewer by the shirt collar and scream, what the hell!? Because (and this is where the Horror part comes in) more and more people who are supposed to know, can’t seem to answer. Art Carney’s brilliantly grizzled performance anchors The Late Show, a fun and nostalgic detective yarn from genre revisionist Robert Benton. Whereas Bad Company (Benton’s strange directorial debut) takes the Western and inserts a dire sense of cynicism, The Late Show turns the Detective/Mystery film into a series of violently comedic pitfalls, mixing traditional Film Noir elements with everything from Screwball to Slapstick. 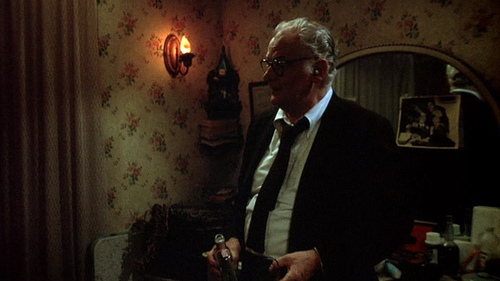 After his long time partner shows up dead, Carney’s retired P.I. is matched with Lily Tomlin’s new age hippie as they attempt to uncover a series of murders in the case of a missing cat. The plot opens up from there, turning on itself more than once to reveal a strange commentary on aging genre characters coming to grips with a changing, more self-obsessed world. Stoic professionalism has officially swerved toward greedy conglomeration. It’s almost Halloween, so I figured it was about time I sat through this “holiday classic.” The verdict: thirty years after its release,The Omen is very safe, methodical, and old fashioned. Maybe its all the remakes, reissues, and knockoffs that have come out since. But the cynical ending of the original must have packed a wallop in it’s time. It certainty still resonates in today’s religion-infused world of politics. 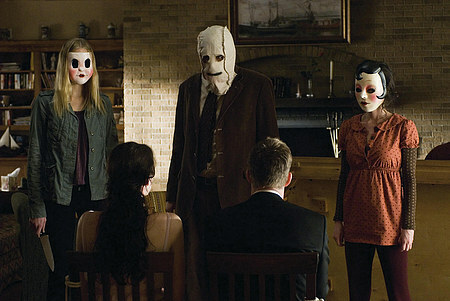 The Strangers doesn’t reinvent the wheel, but it’s a creepy, restrained horror flick that will stay with you for some time. The setup is quite straightforward – three masked intruders stalk a squabbling couple (Liv Tyler and Scott Speedman) in a remote summer house. But the simple scenario provides a look at silent killers with ambiguous motives, making the material all the more terrifying. Director Bryan Betrino often lets the handheld camera linger on his two heroes, silently waiting for the standard horror thrill to pop from the shadows. Instead, the human monsters slowly creep into the light from behind, unbeknownst to the victims, creating a pressure-packed vacuum of tension. Several moments like these make The Strangers truly frightening and the traumatic ending only solidifies a feeling of regret and loss first exhibited in the opening sequences, where the couple shares some fleeting moments of reconciliation before the assault commences. Louis Leterrier’s incompetent and gap-riddled hodgepodge makes Ang Lee’s previous arty foray into Hulk-dom seem like a breath of fresh air. But maybe there’s an excuse, or at least an explanation. Apparently upon release, this The Incredible Hulk was whittled down to a more “audience friendly” length, much to the dismay of star Edward Norton. So the slower character-driven scenes have been eliminated in favor of a relentless, special effects-ladened pace. It shouldn’t be much of surprise then that the plot is absurdly contrived, weighed down by ridiculous CGI scenes and inane characterizations. If I were Norton, I’d be turning angry green right about now. I discovered Edward Yang’s A Brighter Summer Day during my initial exposure to Jonathan Rosenbaum’s indispensable writings, and after falling in love with the director’s last film, Yi Yi, his previous work became “Holy Grail” material for me. Like almost all of Yang’s films, A Brighter Summer Day is completely unavailable on DVD and rarely screened theatrically. So when a good friend emailed me a link to the Los Angeles County Museum of Art (LACMA) series entitled Four Masterpieces by Edward Yang, I was ecstatic at the prospect of seeing A Brighter Summer Day in it’s purest form, exactly as Yang had intended at a whopping 240 minutes long. Needless to say, I made the two hour drive with my girlfriend in tow, loving every bit of the L.A. traffic. Enthusiastically introduced by L.A. Weekly critic Scott Foundas, the film played to a packed house of cinephiles all eager to experience a cinematic rarity. It was worth the trip. A Brighter Summer Day, like Yi Yi, weaves together a plethora of fascinating characters moving through a society in transition, namely a Taiwan infused with Chinese immigrants seeking a better life away from communist China. Yang reflects this tension through the uncertain eyes of S’ir, a teenage boy torn between the growing pressure of school, family, and local street gangs. His subtle plight reverberates in unseen ways, revealing a shadow play of uncertainty in the community as a whole. Yang builds scenes with long takes, holding on characters to experience the reaction of the reaction, giving the film an added sense of depth and clarity that is a staple of his films. A Brighter Summer Day blends elements of tragedy and comedy with ease, melding scenes of harsh conflict with the hilarious nuances of its characters. But this is a film obsessed with disappointment and the melancholy one feels when rosy perception unravels into gray reality. Yang paints the pain on S’ir’s face in multiple scenes, but none more glaring than the devastating climax in the middle of a rain drenched Taipei street. With blood on his hands and panic in his eyes, Yang’s hero is a product of a terrifying identity crisis that transcends class or gender, a state of mind as confused as it is hopeful. 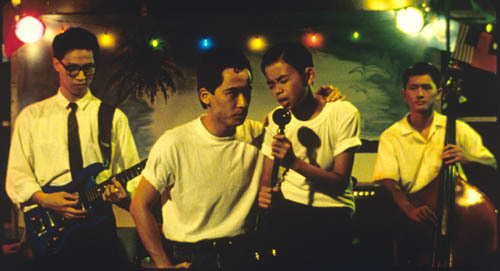 Edward Yang died last year at the age of 59 and it’s a loss many won’t truly feel until his body of work is more widely released. A Brighter Summer Day is a masterpiece of glaring complexity, both a tragic comedy and a comedic tragedy. It dares to glide through bustling and hilarious interactions of everyday life with eyes and ears open, letting the fusion of time and place enable a sense of the struggling humanity fluctuating under a tumultuous and engaging surface of change. Stuart Gordon is no stranger to demented scenarios. Over twenty years ago, Gordon burst onto the horror scene with Re-Animator, an incredibly brutal and hilariously original take on the zombie sub-genre. But his latest directing effort Stuck, takes demented to a whole new level. Gordon once again delves into the realm of the living dead, only not so literally with a clash of living individuals pushed to the fringes of society through economic direst, slowly regenerating into lifeless, and sometimes soulless individuals under the panic of impending failure. The film’s mesmerizing centerpiece, it’s core visual motif and thematic sledgehammer, is that of newly homeless drifter Thomas (Stephen Rea) permanently implanted in nursing home attendant Brandi’s (Mena Suvari) windshield after a violent hit-and-run accident. Gordon uses this symbolic wedge not only as a dynamic image of horror, but to reveal the more subtle nuances of these characters. At first, Brandi’s desperation toward her bloody mess seems like a plot point. But as her deceit and brutality evolve, so does our impression of her plight. Brandi feels as if any negative shift in her life will cause an unravelling that cannot be stopped, which gets specifically at the core her own self-doubt and of American culpability in general. Whether its an economic crisis caused by greedy banks, an immoral war waged in the name of faith, or a devastating chance occurrence, all are failures defined by a lack of self-accountability, a common thread in our current global landscape. 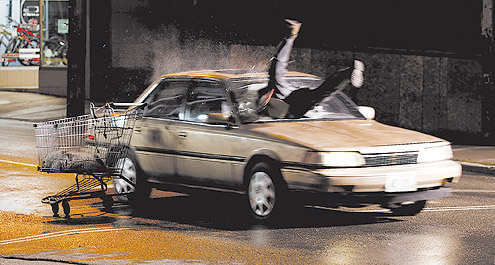 Throughout the film, Brandi pleads that the accident “wasn’t her fault”, and she ends up being consumed by a lack of reasonable perspective. Stuck, while never gratuitous, is a fascinating and relentless horror film about our current state of obsessed individualism, where selfish inaction often supersedes the realistic and deadly consequences of ignoring others in need.